Posted 20.11.2014 by Fascinating Rhythm & filed under News. Fascinating Rhythm were thrilled to be invited to entertain at the Annual Civic Service reception for dignitaries of the South West local authorities and guests. 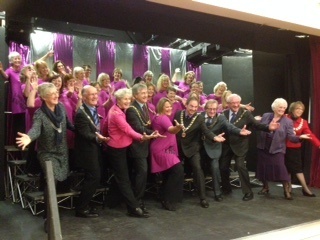 The event was held by Councillor Howard Gawler who stated in his speech how proud he was to know the chorus and thanked Fascinating Rhythm for such a fabulous show. Never to miss an opportunity we requested that some photographs be taken, not quite expecting that we would have them taking part in a choreographed move – look out we may have a new front row!